In the latest peer-reviewed publication on the potential impacts of a border wall on plants and animals, conservation biologists, led by a pair of scientists from The University of Texas at Austin, say that border walls threaten to harm endangered Texas plants and animals and cause trouble for the region's growing ecotourism industry. In a letter publishing Monday in Frontiers of Ecology and the Environment, Norma Fowler and Tim Keitt, both professors in the Department of Integrative Biology, examine what would happen if more of Texas' roughly 1,200 miles of border with Mexico were to be walled off, contributing to habitat destruction, habitat fragmentation and ecosystem damage. Other states have shorter borders than Texas has and more barriers already in place; in Texas, there are walls along only about 100 miles of the border with Mexico. Congress just exempted the Santa Ana National Wildlife Refuge from the new fencing project, but many miles of new barriers are set to be built on other federal lands, most of which are part of the Lower Rio Grande Valley National Wildlife Refuge. 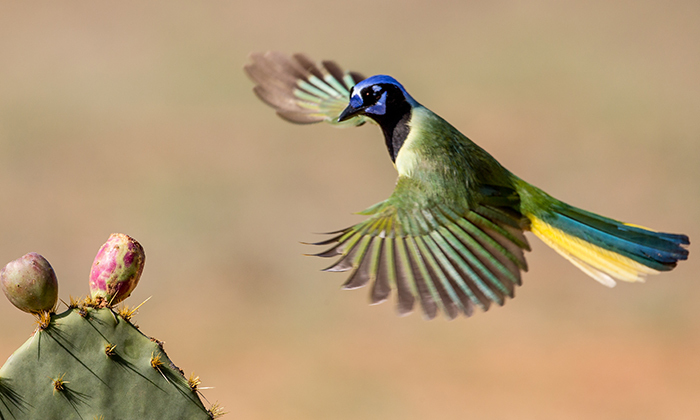 Tropical birds like the green jay attract ecotourists to the Rio Grande Valley. "Up to now, the wall has either gone through cities or deserts. This is the Rio Grande we're talking about here. It's totally different," Fowler said. "We have high biodiversity because of the river and because Texas extends so far south. I and other Texas biologists are very concerned about the impact this will have on our rich natural heritage." Based on a scientific literature review of 14 other publications, including some that looked at effects of existing walls and fences on the border, the authors outlined several concerns about the proposed wall, including habitat destruction and degradation caused by the construction of the wall and the roads on either side of the wall. Of particular concern is damage to Tamaulipan thornscrub, a once abundant and now increasingly rare ecosystem in South Texas. Many South Texas organisms depend on this ecosystem, but it's slowly disappearing as cities, farms and ranches displace the thornscrub. The living things that depend on it would lose access to some of the last remaining patches in Texas if the wall were built, Fowler said. A wall would also affect other species. The endangered wildflower Zapata bladderpod grows exactly where the barriers are proposed to be built, as does the threatened whiskerbush cactus. The ocelot, a small native wildcat listed as an endangered species, has already suffered from severe habitat loss; the Texas Parks and Wildlife Department estimates there are no more than 120 left in Texas, and scientists worry that the wall would further deplete their numbers. With habitat fragmentation, the wall could cut off ocelot, as well as black bear, populations in Texas and Mexico from other members of their species, leaving some populations too small to persist. There would be further damage to plants if the pollinators and seed-dispersing animals that plants depend on could not cross the barrier. Scientists also expressed concern about another aspect of the project. Because the wall will probably not be built in the flood plain of the Rio Grande, it will have to be set back from the river, sometimes by more than a mile. This has the potential to damage the valuable riparian forest ecosystem along the river, cutting off organisms that need to get to the river and preventing people from accessing several wildlife refuges along the river used for ecotourism. A zebra longwing butterfly rests on a branch at the National Butterfly Center in Mission, Texas, which is located in a part of Hidalgo County where new border barriers could be erected soon. "Even small segments of new wall on federal lands will devastate habitats and local recreation and ecotourism," said Keitt, also a professor of integrative biology. The Lower Rio Grande River Valley is currently a top destination for birdwatchers because rare tropical birds such as the green jay and the Altamira oriole are among those that frequent the area. A 2011 study from Texas A&M University estimated that ecotourism, mostly from birdwatchers, generated more than $344 million in economic activity in the Lower Rio Grande Valley alone. "If ecotourism declines significantly because access to preserves has been impeded, there may be negative economic impacts on the region," the letter states. "On the other hand, if the barriers are not far enough from the river, they may trap wildlife escaping from floods, and may even act as levees, which tend to increase downstream flooding." Scientists also expressed concern about the project being exempt from environmental review requirements. "Negative impacts could be lessened by limiting the extent of physical barriers and associated roads, designing barriers to permit animal passage and substituting less biologically harmful methods, such as electronic sensors, for physical barriers," the letter states. Olivia Schmidt, also of UT Austin, Martin Terry of Sul Ross State University and Keeper Trout of the Cactus Conservation Institute are also authors of the letter.